Several months ago, we reported here on the crisis at USQ regarding severe cuts in the department of mathematics and computing as part of its larger restructuring program; as a consequence, the department has shed eight net jobs (most of which by voluntary redundancies). This was less than the number of cuts initially planned before the campaign to support the department, but still clearly a severe blow to what had been a department of about 25 staff. I am told that the department is also still looking to fill a statistics consultancy position, which was introduced as part of the restructuring process. While on the topic of academic staff positions, it seems that the forced redundancies proposed by Victoria University (that we recently reported on here) are to be converted to voluntary redundancies, and possibly reduced in number, following pressure from the NTEU, and the discovery that the apparent budget savings arising from such a program was less than expected. On 17 March 2008, the University of Southern Queensland (USQ) at Toowoomba announced proposals to cut staff at the Department of Mathematics and Computing (which consists of the disciplines of mathematics, statistics, and computing) by almost 50%, eliminate all non-service teaching classes from the mathematics curriculum, and also eliminate the mathematics, statistics, physics, and chemistry majors at USQ. These proposals were part of their rationalisation program entitled ““Realising our Potential“. This program was not initiated in response to any immediate financial crisis at USQ – the university recently reported a doubling in its annual profit, to $10.3 million – but out of a desire to significantly change the spending profile of the university, in particular to reduce the proportion of university expenditure going towards staff. The staff reductions in each department were not to be based on research performance, teaching, or service, but were instead to be determined on purely by the student enrolments in the majors of that department. Staff cuts, particularly in mathematics and the “hard” sciences, are unfortunately an all too common occurrence these days in Australia, as well as overseas. But the cuts at USQ were particularly severe, and would have severely impacted maths education and training in the region, as discussed by Peter Hall in the President’s Column in the previous issue of the Gazette. Initial correspondence with the USQ administration on these matters did not get very far, and so in the beginning of April, I and several other Australian mathematicians launched an online campaign, at http://terrytao.wordpress.com/support-usq-maths/, to urge the USQ administration to work with the department to retain its mathematics training and education capability as much as possible. A number of colleagues, both in Australia and abroad, have queried with me our reasons for taking such a strong position on the threats to dramatically cut mathematics at USQ. I should give a little background here, directly connecting the challenges facing USQ and a number of other universities (the University of New England is high on the radar in this respect), to the national skills shortage and the severe shortage of trained mathematics teachers in Australia. It will be clear to avid readers of Terry’s blogs that at least part of the material below is treated elsewhere, but it is probably beneficial to have a separate account of the issues on this particular site. Last Thursday, there was a two-page spread in the Toowoomba Chronicle concerning various aspects of the USQ restructuring proposal. One page was devoted to the impact of the proposal on students in the Bachelor of Music (which is being discontinued, being replaced by a less specific “Bachelor of Creative Arts”), in an article by Merryl Miller entitled “Low note: music students no longer singing uni’s praises“. 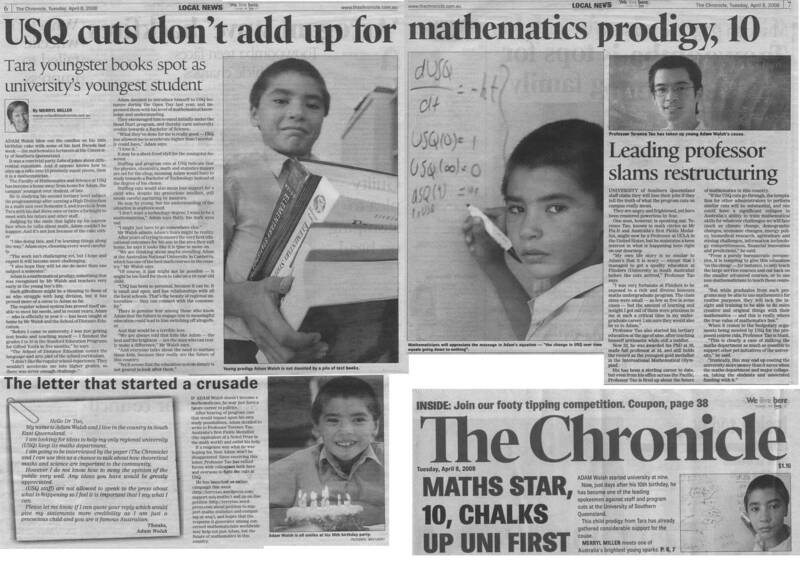 The other page contains an article by Lacey Burley, entitled “Lost opportunities sadden maths whiz“, is centred around Adam Walsh, the ten-year old in southern Queensland who was taking maths classes at USQ and working towards a Bachelor of Science degree there, although with the impending staff cuts (and the concomitant increase in staff workload) it is unlikely that the remaining faculty be able to accommodate Adam’s needs. The Chronicle also reported on Adam last month. As reported in that article, Adam wrote to me back in March concerning the cuts; his letter was not the only one I received alerting me to the crisis, but it was one that resonated particularly with me, given that his education experience is very similar to my own (though in my case, the cutbacks to my mathematics department at Flinders did not occur until after I had completed my degree). According to Universities Australia (using data supplied by DEST), student-teacher ratios at Australian universities have risen from 13-14 in 1990 to over 20 by 2005; net numbers of staff have grown slowly over this period, but not nearly as fast as student enrolments. (Some related data by Universities Australia can also be found at this page.) For comparison, international averages of such ratios are about 16-17 (see page 16 of this report; in the University of California system, the ratios are about 17-18. There may be differences in methodology across countries, though, that make it difficult to make exact comparisons). At USQ, with approximately 16 FTE (full time equivalent) staff teaching mathematics and statistics, and 440 EFTSL (equivalent full time student loads) being taught (mostly in service courses), the student-teacher ratio is approximately 28. With five staff cuts in these divisions still planned (and the two new positions being non-teaching in nature), this ratio will almost certainly increase. According to today’s Toowoomba Chronicle, the staff cuts for the current round of the USQ “Realising our Potential” initiative have begin, with four forced redundancies in the Department of Biological and Physical Sciences, and with 17 further “voluntary” redundancies sought in academic staff across the university, including three positions in mathematics and two in statistics (though there is also one new mathematics teaching liason position and one statistics consulting position that these staff can apply for). There does now appear to be some commitment by the administration to retain the undergraduate maths and stats major (though not the masters program), although with the staff cuts there is likely to be quite severe teaching loads on the remaining staff (the two new positions are non-teaching; also, six staff cuts are planned to the computing division which has shared teaching duties in the past, though many of these cuts will be by attrition as several staff in that division have already quit USQ). 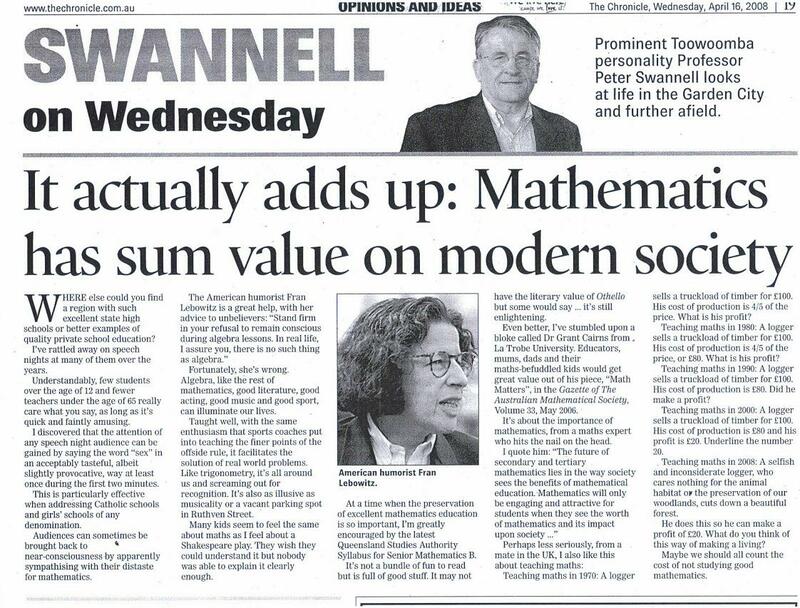 As indicated in the above article, the pressure from the mathematics community and its supporters (including, crucially, some elected officials) has had some success in mitigating the worst effects of the originally planned cuts, but the results are still decidedly mixed. The situation is still rather fluid though; I will post further developments here as they come in. No discussion of current affairs in mathematics in Australia would be complete without mentioning the state of affairs at the University of Southern Queensland, which as part of its restructuring proposal entitled “Realising our Potential” had planned to eliminate several majors including mathematics, statistics, physics, and chemistry, as well as all non-service courses in these areas, and cut staff at the Department of Mathematics and Computing by 12 members (almost 50%). More details on this are at the campaign page to support maths at USQ, my own post on this at my other blog, and at my editorial at the Funneled Web. There have been a number of developments since the campaign was launched on 5 April, with decidedly mixed results. On the one hand, the campaign has attracted a broad and strong response, not only from the Australian mathematics and statistics community, but also from the other sciences, the international community, industry, media, and from the local government and community. For instance, the online petition to support USQ now has over 900 signatures, including the Nobel Laureate in Economics Clive Granger, the former Dean of Sciences at USQ Hugh Avey, and many other leaders in Australia and overseas, as well as many staff, students, parents, and other members of the USQ community; a selected sample of such comments can be found here and here. (The entire petition was presented to the USQ administration on 14 April.) The local member of parliament for Toowoomba South (where USQ is located), the Hon. Mike Horan, also gave a speech in support of mathematics at USQ in the Queensland Parliament, as well as on ABC radio. There have also been strong letters of support from many organisations, ranging from the Statistical Society of Australia Inc. to the Toowoomba and Queensland maths teachers associations, to the International Mathematical Union, to the National Tertiary Education Union. There has been a fair amount of newspaper media coverage as well, for instance at the local Toowoomba Chronicle (see for instance this two-page article from 8 April) and at the Australian (see e.g. this article from 1 May), as well as an editorial by the former Vice-Chancellor at USQ, Peter Swannell. This strong response does appear to have had some impact on the USQ administration as it revised its restructuring proposals (and extended its deadlines for finalising them). In the latest version of proposal, released on 1 May, some additional funding has been located by the administration, to reduce the net cuts at the Department of Mathematics and Computing from 12 to 8 (with 11 staff cuts being offset by 3 new specialist positions in teaching and outreach), with mathematics and statistics in particular shedding 5 jobs instead of 8; nevertheless the department is bearing by far the largest burden of the cuts to the Faculty of Science (in fact, it is absorbing 8 of the 7 net cuts, with the remaining departments in fact having a net increase of one staff member). Majors in mathematics, statistics, chemistry, and physics are not automatically eliminated in this new proposal, but are to be subject to some unspecified “review” to determine their “viability”. It has been difficult to obtain clarification of what this actually means, though when the administration was pressed by the media (for instance here or here) they have at least appeared to make efforts to retain it. However, in view of the staff cuts (which will be increasing the teaching workload on the staff to an elevated level) it is difficult to see how a viable maths major can be formed without reducing the cuts further.